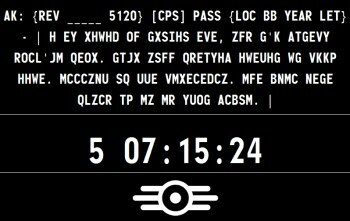 The purported Fallout 4 teaser site at TheSurvivor2299.com is sporting a couple of rather disturbing new messages. You've no doubt heard by now that Pete Hines, Bethesda's VP of public relations, said Fallout 4 will not be showing at VGX. More specifically, actually, he said he's not going to VGX and that Bethesda's not making a presentation during the show. Of course, he also said that Arkane isn't working on Prey 2, so take it for what it's worth. Legitimate or not, the teaser has been a lot of fun so far and it's not over yet. The site recently posted another encoded update and a new morse code message, both of which have once again been translated by the beautiful minds at Reddit. The message in text on the site translates to, "I am sorry to inform you, but I'm afraid they're dead. Your life support system is just fine. Welcome to The Institute. The only safe place to be in this world." The morse code message is somewhat trickier to put together. The message is, "Clg BR EMRG Is OVR We Ar OTNB WT AmO STH AtK CMP WA DD N WY OU All UNT CD 512Ã˜ EVAC Z Y X YUr NXT" but what that actually means isn't clear. "Calling Black Row" seems obvious enough, and from there Reddit takes it as either "Emergency is over" or "Emergency! It's over," which seems somewhat less likely. "We are [either 'On the North Bridge' or 'Outnumbered,' which seems more likely to me] without ammo. Something attacked camp. We are doomed [maybe? ], no way out, all units [and then another questionable bit, either 'confirmed dead' or 'code'] 5120: evacuate. Z Y X, you're next." The "5120" bit may reference the "-TBNLS 5120-" that ended an earlier message. No clue what the "Z Y X" means, and like that other message, how this one is interpreted - "Emergency is over" or "Emergency! It's over" - leads to two very different conclusions. And "You're next" - threat or promise? There's no question that Hines' statement rather strongly implies that this is not a legitimate Fallout 4 tease, but it's also worth remembering that the VGX awards happen on December 7, while the countdown won't hit zero until December 11. And even if it is a hoax, it's been a great one so far and I'm looking forward to more. I also have an unsolicited suggestion for Bethesda: If it does turn out that someone is faking us out with this, hire him.